A little to the north-west of Stockton lies the village of Carlton, and a few hundred yards to the north of that can be found Greystone Lodge. Astonishingly, this little corner of the North-East was once, briefly, the home of the great George Orwell during what was one of the most important periods of his life. Already suffering from ill-health, the author and his wife, Eileen, moved there in 1944 together with their adopted son, Richard, following bomb damage to their London flat. The house belonged to his wife’s sister-in-law, Gwen. It was here that Orwell put his finishing touches to Animal Farm, which was published in 1945 – and highly likely that work was commenced (at the very least in his head!) on Nineteen Eighty-Four (working title The Last Man), which itself was published in 1949. The peace and quiet of Greystone must have seemed a world away from the horrors of the ongoing war, of which Orwell was desperate to be a part of (but was preclude from on health grounds). But it wasn’t to last. For when he was offered (and accepted) a post as war correspondent in France in 1945, his wife died in his absence on the operating table in Newcastle whilst undergoing a hysterectomy. He returned to Greystone to find her unfinished final letter home from her hospital bed lying on the hall table. He remained for a few more days, attending to the funeral and his adopted son’s future, before severing his links with the North-East for good. He struggled on for a few more years through ailing health, until his own death in 1950 aged just 47. P.S. 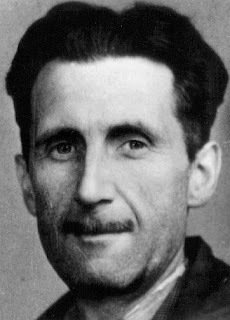 Strange but true: Orwell’s real name was Eric Arthur Blair, and Greystone overlooks the parliamentary constituency of Sedgefield, Tony Blair’s old stamping ground. Old Stillington – the original village, not the nineteenth century creation which jumps out at you from the map of today – lies a mile to the south-west of the modern affair on a quiet back road. Its simple layout has scarcely changed since the time of Anthony Carlisle’s birth there way back in 1768 – a young lad who would move onto the world stage during the course of his lifetime, yet is barely remembered today. The son of Thomas Carlisle by his first wife (identity unknown), Anthony was apprenticed to medical practitioners in York and Durham, before completing his studies in London and being appointed Surgeon at Westminster Hospital in 1793. He remained there until his death in 1840. But in the days when men of science dabbled in several disciplines, Carlisle’s mind often wandered. During one such ‘distraction’ he made the not insignificant discovery of the process of electrolysis with chemist William Nicholson in 1800 – this being the process of driving chemical reactions by passing electricity through a liquid substance*. In this case, it was the passing of a current through water, thus decomposing it into its basic elements of oxygen and hydrogen. Just as importantly (for him, at least) he got himself married in 1800, too, to one Martha Symmons. Though he never followed through with his newly-created science, many others did to stunning effect. 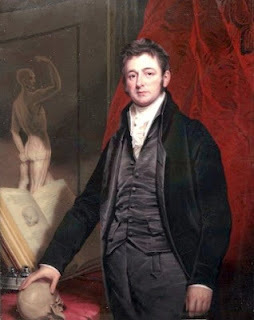 Carlisle’s contribution was acknowledged, though, when he was elected a Fellow of the Royal Society in 1804 (and served as Professor of Anatomy of the Society during 1808-1824). From 1815 he began a long association with the (Royal) College of Surgeons, serving as president in 1828 and 1839. He lectured widely and prominently**, and was appointed Surgeon Extraordinary to King George IV(1820–1830) – and must therefore have known, quite intimately, the sufferings of the monarch’s father, ‘Mad’ King George III, prior to the man’s death in 1820. Carlisle was knighted in 1821, and died, after a long and successful career, in London in 1840. He is buried in Kensal Green Cemetery. * & ** Because of his association with electrochemistry, Carlisle has been labelled ‘The Real Mr Frankenstein’ (see here, and see also here – and scroll down), and his lectures were often especially graphic – and very popular! He may even be the author behind the 1797 gothic horror classic The Horrors of Oakendale Abbey, which tells of resurrected men and body-snatchers. The village of Great Stainton is so named, one assumes, to distinguish it from lesser known – and smaller – places of the same name scattered around and about the Co.Durham settlement. There’s Little Stainton, Stainton Grange and Stainton Hill House – to name the few I can find on a modern-day map. It is also probably the ‘original’ Stainton, situated, as it is, directly upon the course of an old Roman road – the Great being added in the 17th century. The thoroughfare (which no doubt pre-dates the Roman era) runs roughly north-south through the village along the course of the present-day metalled road. It was once known as ‘Stainton-in-the-Street’ or ‘Stainton-le-Street’, being reference to its situate – though, interestingly, the place-name experts would have us believe that the word ‘Stainton’ on its own actually means ‘farmstead by the paved road’ (from the Old English stanwegtun). An early Roman coin from the reign of Emperor Vespasian (9-79AD) was found in the churchyard, indicating that the legions came this way at a very early point in their occupation of Britain. When the Anglo-Saxon settlers came along and started tagging names to their places, they came to this corner of the region, found a few houses sitting astride a nice cobbled road … and Stanwegtun was born. Having said all this, the staggered (Roman) crossroads 200 yards north of Great Stainton was most probably the site of the first community. For here there are faint traces of the settlement shown on the early OS maps as ‘Cross Hill’. The prominent set of earthworks known as Castle Hill, near Bishopton, a few miles west of Stockton, is one of the finest examples we have in the region of the classic Norman ‘motte and bailey’ design of fortification. There is a 38ft high central, circular mound (or motte), surrounded by a ditch and earth bank. Around and about various earthworks may be found, providing clear evidence of a ‘bailey’, plus causeways and embankments (nice shot here). Nearby Bishopton Beck would have fed the moat, rendering the castle an island of sorts should the need ever arise. Its origins are not known, but most probably lie in the early twelfth century. The site certainly seems to have been pressed into service during ‘The Anarchy’ of 1135-53, with Bishopton Castle being, possibly, the site chosen by Roger Conyers to defend himself against the Bishop of Durham when a dispute arose over the see. At its ‘peak’, it is likely that the fortification was little more than a timber fort – though with an elaborate outlying complex. Local legend has it that the hill is haunted by fairies, and that every time someone tries to take soil from the site they are warned off by whispering voices. It hasn’t stopped some, though – as recently as the year 1800 the hill stood as high as 60ft, apparently. 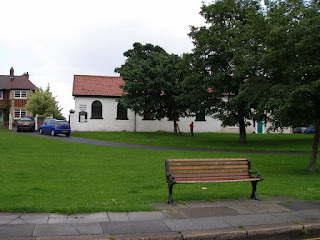 The first Quaker Meeting House proper to be built in the settlement of Norton was on the site of the current affair in the year 1671. Much altered over the years, the present structure dates from 1903 when it was rebuilt in the style of the original building. What is remarkable, though, is how the religious body itself has managed to survive at all. Whilst some sources refer to the town’s ‘comparatively peaceful history’, the Quakers have suffered anything but a quiet existence there. Born around the time of the English Civil War, the Quaker movement made enemies of both Roundhead and Royalist alike – though the former tolerated them due to Quaker sympathies among their foot soldiers. On the Restoration in 1660, there was a severe clamp-down on the activities of the ‘obstinate men and women’ of the parish ‘who would not let down their conventicles’. King Charles II sent a party north to root out the Quakers – one Simon Townsend having his house taken (the site of the alleged activities of the dissenters). Townsend and several others were severely punished, with the period of oppression in and around the town continuing deep into the 1660s. The record books are peppered with cases brought against the peace-loving ‘Society of Friends’ groups of this period. At the very height of the oppression, the Norton group built their first ‘official’ Meeting House on the village green in 1671. Massive fines, transportation and the like continued for those openly flouting the obligation to attend ‘national services’ in favour of their own religious gatherings, but the Quakers hung on until the ‘freer’ days following Charles II’s death in 1685. Though, in fact, an Act was passed against them as late as 1687 barring them from entry into many professions, they laid low thereafter, concentrating on social and industrial endeavours to stunning effect through the Industrial Revolution and beyond.